Saturday 28th April 2007. 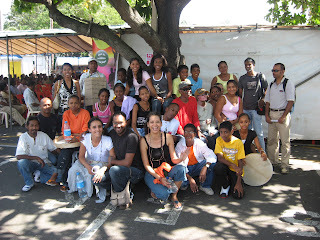 The children attending the Saturday care project were exposed to what it is all about May Day. This was done mainly through some specific songs from the abaim repertoire. Children after singing the songs were prompted to revisit them through the contextualisation of the song in the first instance and secondly through attempts at discovering the various trades and occupations referred to in the songs. This cultural activity proved fruitful in that it clearly showed that a lot of job occupations are by now escaping the collective memory of the population. Children and even adults no longer know what it is to be a “debarder”, a “kolom”, a “sirdar” or a “chokra”. The most promising inference however remains the sustained interest of children to know more about these occupations, the more so that they encounter these occupations in the folk songs abaim is now trying to conserve and disseminate. This activity lasted for more than three hours without the children getting bored in any way! 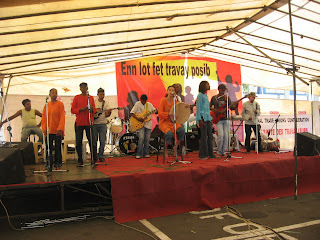 Abaim participated through a musical performance in the forum organized by the Unions on May Day 07 at the place Taxi in Beau-Bassin. 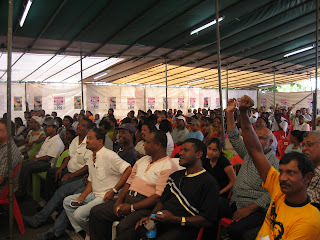 The musical group contributed to raise consciousness on a number of issues pertaining to the history of workers’ struggle from slavery to modern times (400 kanon pu kolon), to the precarious conditions experienced by factory workers with factory closures (kadna), to hardship experiences by workers in sugar cane fields (lalinn kann), to opposing inhuman conditions throughout history (rezistans). The audience was gratified as well with a song composed collectively with children and in which the so many tools used by workers find their way for recognition. Souvenir enn 1ye Me – lor laplas taxi Bo Basin. Mari top seki zot pe fer!!! Top rasanbleman.Vag la ankor existe. Bizin kontygn zwenn pli souvan pou ranforsi li. Félicitations pour votre engagement et votre belle joie de vivre ! Bravo !